An Austrian medical student is accused of spying while holidaying in pre-Second World War France and strives to prove his innocence to the sceptical authorities. But they refuse to believe that his snaps of military installations were an accidental by-product of his love of wildlife photography, leaving him facing the prospect of the death sentence. 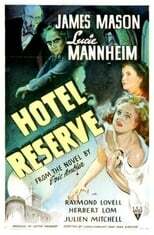 Espionage thriller, starring James Mason, Lucie Mannheim, Raymond Lovell and Julien Mitchell.